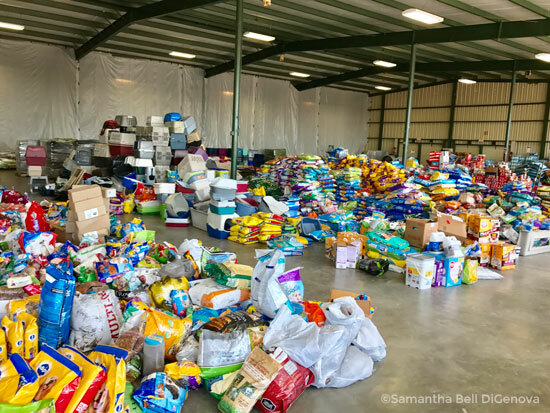 Best Friends Animal Society, which has helped in disaster areas before, would be going to Texas to rescue animals in and around the storm-ravaged zones. 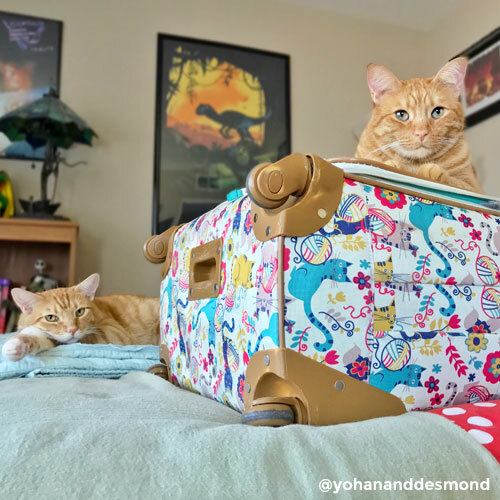 While going to Houston was not mandatory, Best Friends needed to send two or three Los Angeles staff members to Texas, and Samantha knew immediately that she wanted to go. Best Friends had staff on the ground in Texas on August 28th, shortly after the hurricane hit. 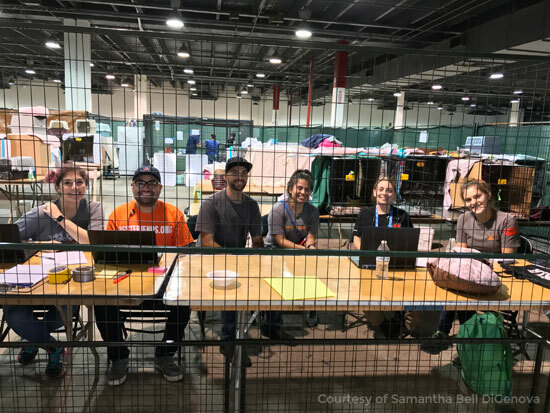 The Los Angeles team deployed to Houston about one week later, once the organization knew where help was needed most. Local shelter pets who were already in the shelter before the storm and had to evacuate to make room for all of the new homeless pets. Animals pulled from the flood zone. Pets owned by people who were sheltered at the Montgomery County Fairgrounds (a shelter operated by the Red Cross). Best Friends helped care for those pets so the owners had one less thing to worry about during their stay at the shelter. But Samantha’s thoughts quickly turned to worrying about the cats being in such a stressful environment. 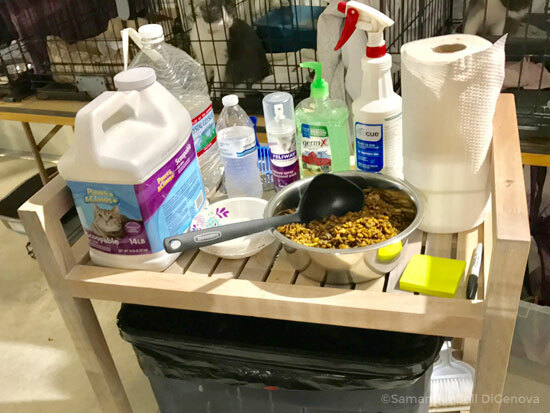 And now, Samantha shares her experience of caring for the cats after Hurricane Harvey in Texas. A two-minute video from Samantha’s time in Houston. What was it like when you arrived at the Rescue and Reunite Center? The air was filled with the sound of hundreds of dogs barking and the smell of wet dogs. I was worried the cats would be so stressed, but things were set up so nicely for them! The cats were in the back, in an enclosed room that was very peaceful. Right away, I ran into a fellow L.A. staff member and friend, Alyss, and she showed me around and introduced me to people. I met about 40 new people from all over the country (staff, volunteers, and locals) my first day there. It was exhausting and wonderful! What was your primary role in Houston? 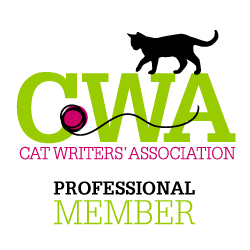 My primary role was cat care. 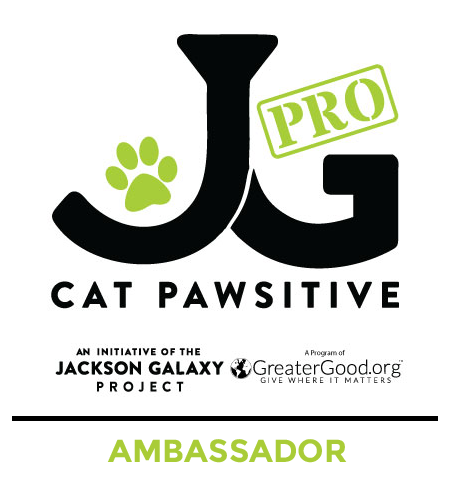 There were three of us in charge of the cat area – two cat caregivers from our sanctuary in Kanab, and me from Los Angeles. The other two arrived about a week before I did, had set up the cat areas so nicely, and they were welcoming and wonderful to me. We made a great team! Most staff were deployed for two weeks, so the three of us were the pioneers of the cat areas. 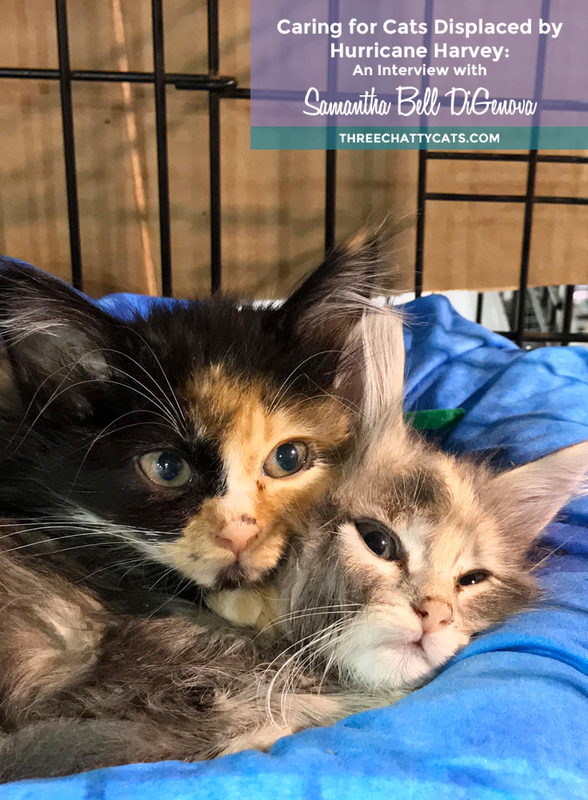 We got everything set up nicely and running smoothly at the Fairgrounds, and then the three of us packed everything up (cats included) and moved the entire cat area an hour away to our new location, the Pet Reunion Pavilion at the NRG Arena. Why did Best Friends relocate to the Pet Reunion Pavilion? 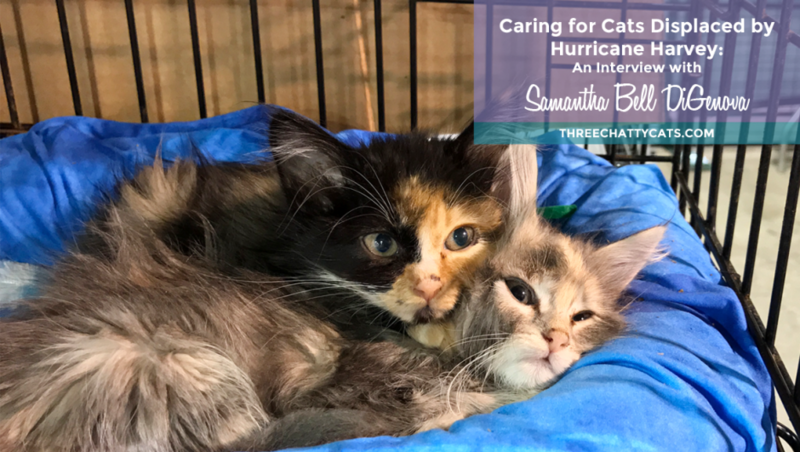 The Rescue and Reunite Center at the Montgomery County Fairgrounds was our original location, but it was not big enough, and it was a little too far away from Houston (about an hour away). So, we moved to the Pet Reunion Pavilion at the NRG Arena during the weekend of September 9th and 10th. When we left the Fairgrounds and moved to NRG, we left “#3 cats” [pets of owners being housed at the Red Cross shelter] there, and the Montgomery County Animal Shelter continued to care for them. We did not want to take owned pets an hour away from their owners who were living at the Fairgrounds. Once we arrived at NRG, we only had cats from categories #1 [local shelter pets] and #2 [animals pulled from flood zones]. We had no way of knowing if some of the cats were strays or lost pets, but they were all so sweet! What was a typical day like in caring for the cats? We came in every day at 7am and fed the cats, then cleaned all of their cages, then assisted the vets with intake exams and vaccinations for the new cats, then fed the cats again, then tidied up, then had our nightly all-staff meeting, then checked on all of the cats again, then went home around 10pm. After six days of 16 hours a day on my feet, my left leg kind of gave out. I went to urgent care, and they said I had Achilles tendinitis and a sprained knee. So, my role then became more data entry-based. 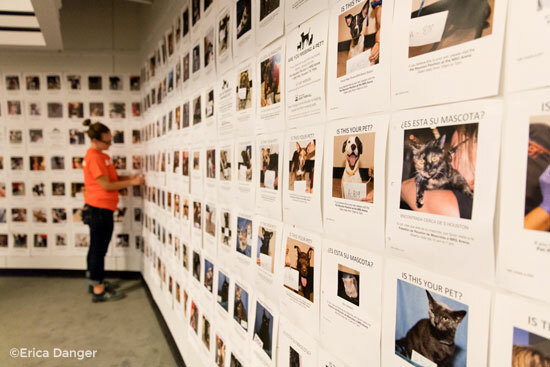 During my last few days in Houston, I got all of the cats’ locations entered into our database, created official guidelines and volunteer instructions for the cat area, entered behavior notes on all of the cats, and worked with photographers to get all of the cats photographed. I was just happy I could stay with the kitties the whole time! About how many cats were in your care? We had 100 cats while we were at the Fairgrounds. Then we added about 30 more cats once we arrived at the NRG center. With only three staff for that many cats, we really relied on our volunteers to help us clean, feed, and restock. They were so wonderful and helpful! 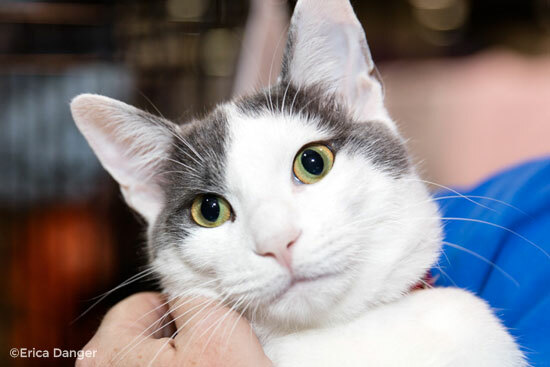 In the various Facebook Live videos that Best Friends has shared, many of the cats seemed relaxed in their kennels, even with all the loud barking and general background noise. Did most cats adjust fairly well? How did you keep them comfortable and relaxed? Texas cats are very laid-back! I was surprised and impressed by their adaptability and resilience! We were thinking that perhaps they were just relieved to be safe and have shelter and food. We also tried so hard to keep them feeling safe and comfortable. We had hidey beds, boxes, and bags for them. We covered all of the cages as much as possible so they felt less exposed, we asked visitors to be calm and quiet, one of the vets gave us giant bottles of pheromone spray that we used, and we made sure that every cat always had a toy. 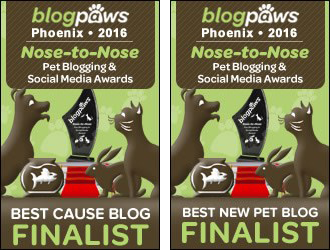 Did Best Friends partner with any other rescues or organizations? Best Friends partnered with Montgomery County Animal Services while we were at the Fairgrounds (not a rescue, but they have a very high save rate and do great work). They were awesome! It was wonderful to work with them! While I didn’t work with any other rescues, there were other rescues in Houston that had their own setups like ours. And we had specific staff that served as liaisons with those rescues, who arranged for pets to be transferred to them. And while the Pet Reunion Pavilion was run by Best Friends, we had vets and medical staff from other rescues helping as well. We had a vet from Angel City Pit Bulls volunteering her time to help us, and medical staff from rescues all over the country. Also, I’d love to give a shout out to our volunteers there – every single one of them. Some were Best Friends volunteers from the sanctuary and from our regional adoption centers, some were Houston locals, and some traveled from all over the country to help. 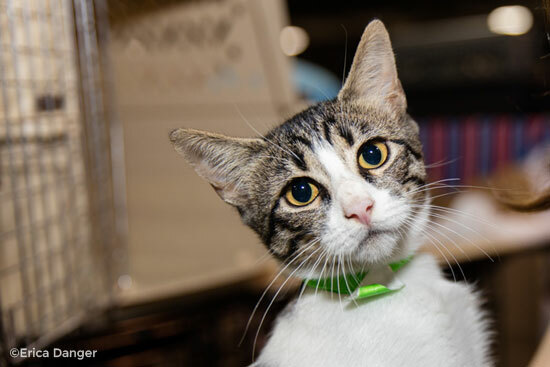 Many had no experience with shelter cats, but they were quick learners and hard workers. Every single one of them worked tirelessly for days on end. We truly couldn’t have done it without them. Did you personally get to witness any reunions? I witnessed one cat reunion when we were at the Fairgrounds. It was so heartwarming and emotional! A lady found her senior black cat, Ghost. She was crying, we were crying, and she told us that Ghost had been through two hurricanes, Rita and Harvey. And, I heard there was another cat reunion at NRG after I left. I’ve heard that the return rate for cats in disasters is about 2%, which is about what ours is so far. We’re still hoping for more though! Did you have a favorite cat that stole your heart? I fell in love with a very old brown tabby on my first day. We named her Jessica Lange. She was with us at the Fairgrounds and then came with us to NRG. She’s about 18 years old and was found as a stray during the flood. She was skinny and rickety and so sweet! I can’t even imagine what she’s been through, yet she took everything in stride! She was amazing. I would visit her throughout the day every day, and she was so happy when she’d hear me call her name that she’d rub on the bars and flip upside down in her bed. It sounds cheesy, but she represents my Houston experience. I met so many locals that had been through so much, yet were so kind and generous. And the cats were all so sweet. I wish I could articulate the experience better; it was life-changing. And I recently found out that Jessica Lange was adopted by one of the vets at NRG!! I couldn’t have hoped for a better outcome for her! Jessica Lange has been adopted! 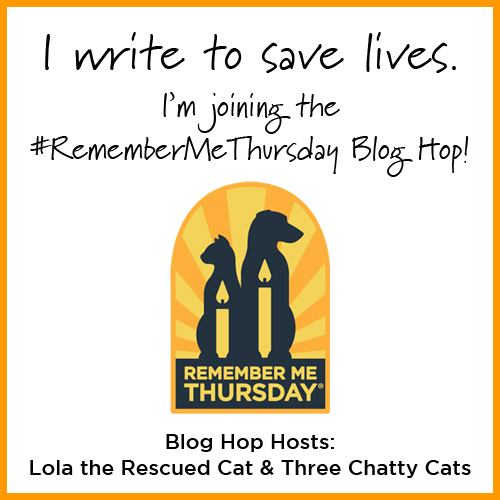 You’ve worked with cats for a while now, but what did this rescue experience teach you about cats that you didn’t know before? I saw a resilience in cats that I’d never experienced before. I worry so much about every adoptable cat I meet. I want their environment to be as perfect as can be, so they will feel their best and find a home. While I’ll never stop thinking that way, the Houston cats gave me some peace of mind that even if a cat’s environment isn’t perfect, they can still be ok. They can be in a small cage for weeks, surrounded by a deafening chorus of hundreds of dogs barking, and they can still be happy. I feel like I can stop stressing a tiny bit about every little thing surrounding our cats in Los Angeles. And if I’m less stressed, then the cats I interact with will be less stressed. I know that Best Friends is holding the cats for 30 days to allow time for owners to find them. What will happen to the pets once that time is up? Most of the cats were found in early to mid-September, so many of them are becoming available for adoption each day. 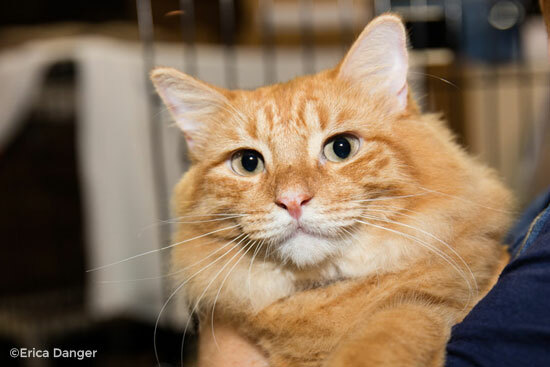 Any cat (or dog) that is not adopted will be rescued by either Best Friends or our network partners. All of the animals we cared for are safe no matter what happens. We plan to stay in Houston until every animal is safe in a home or rescue. And, there are plans for a Super Adoption event there sometime soon, once all of the holds are up. In the midst of rescuing and caring for the pets displaced by Hurricane Harvey in Texas, Hurricane Irma hit Florida. Did anyone from Best Friends in Los Angeles head to Florida? I know we did send some staff to Florida, but the shelters and rescues in the area were super prepared and were able to send their animals to rescues and shelters in Georgia and other areas in the Southeast. There isn’t as much of a need for us in Florida as in Texas, but we’re still assisting wherever needed to ensure all of those animals are safe, too! You’ve said this has been a life-changing experience. Do you have a most memorable moment from Texas? This was definitely a life-changing experience! My most memorable moment occurred at the Fairgrounds. We had two ladies come through the cat area looking for their two cats. They told us that their home flooded and they were stranded on their roof with their dog in their arms and their cats in carriers. Two boats came up to rescue them, and they went in one boat with the dog, and another boat took the cats in the carriers. Suddenly, the boat with their cats in it turned around and went to rescue another person. And two weeks later, they have no idea where their cats are. They were sobbing. They’d lost everything and just wanted to know that their cats were safe. It made me realize that the people who lost their pets in the disaster should not be generalized as irresponsible or uncaring. There were so many circumstances beyond everyone’s control. Now, I get upset when I hear people bash those that “abandoned” their pets during the hurricane. I don’t think those people truly understand the devastation that happened in Houston. This encounter gave me such an appreciation for the severity of this disaster as well as for the people of Houston. Yes, every day that I was in Houston, I was amazed that a tragedy and disaster could bring people together to create something so wonderful. When people ask me how Houston was, I say, “Amazing!” But I don’t think that the disaster was amazing by any means. What happened in Houston truly breaks my heart. 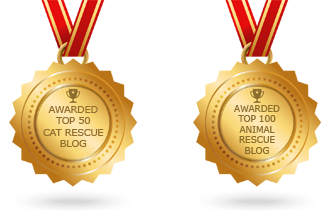 But that disaster brought so much good to the animal rescue world. Hundreds of animals are now safe. Hundreds of like-minded people came together to work toward a common good. I saw the best in people because of something really terrible. And these days, that is so needed. There are so many terrible things in the world and our country, but I saw so much good in Houston. All of these items were donated by the public! A big thank you to Samantha for sharing her Houston experience with us! You can read more about Samantha in our previous interview with her. 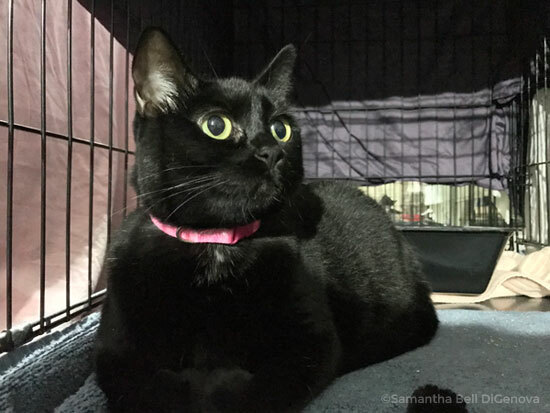 Also, Samantha shares photos of her cats on Instagram, along with adoptables from Best Friends. Note that Best Friends has a Lost and Found page that people can use to help locate missing pets after the hurricane. Also, people looking for general information on how to help (like donating, fostering, volunteering) can visit the Hurricane Harvey page on the Best Friends website. Photos courtesy of Samantha Bell DiGenova and Erica Danger (@ericalikescats on Instagram & Twitter). Oh wow. What a great interview. Bless Samantha and all the other volunteers for all their efforts and hard work. She really went above and beyond. 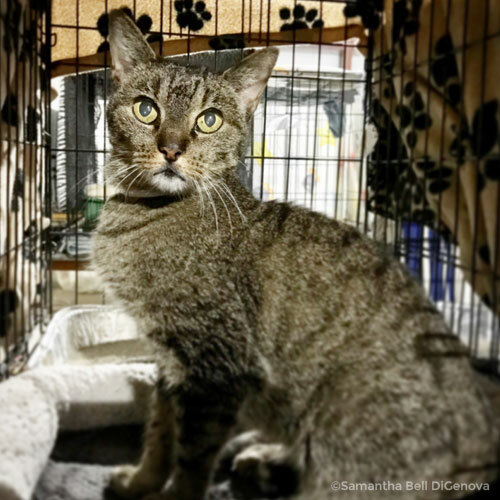 So happy to know Jessica Lange the senior cat got adopted at 18. Those cats are troopers and showed such strength in such chaos. It really warms my heart to see how much the public helps one another when it really counts. I’ve only heard great things about Best Friends Animal Society. Keep up the great work. Heartwarming story. Can’t even imagine losing my cats. I am thankful for people like Samantha and all those who help pets in need. The interview was great – Samantha’s personal journey to Houston is inspirational. It’s good to hear some positive stories coming out of such a tragedy. Her reminder that not every cat left behind was abandoned is so important – we should never judge a pet parent without knowing the whole story. This is such an important topic to blog about these days. I am so very grateful for people like Samantha and organizations like Best Friends who work tirelessly for animals. OH! Got a lump in my throat as I read this! 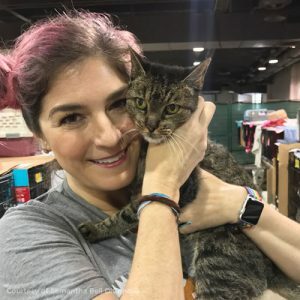 Kudos to Samantha and all of Best Friends, for their unerringly conviction to helping animals, and to those nameless volunteers who get it all done. WOW! Only 2% return rate? Oh my gosh, that’s really depressing. This was so interesting to see how they broke the cats down between different groups, so well organized! Much different from the stories I heard from friends who volunteered during Katrina. P.S. : Loved the video. Really gave a sense of the magnitude of this rescue effort. This is a wonderful interview, and one that truly warmed our hearts. Thank you so much for sharing it. Thank you, volunteers! I can’t think of a more rewarding way to help in disaster relief. And so glad Jessica Lange found a good home! We loved your interview and we love Samantha too!!! Wonderful interview. The piece about the owner reunion rates is heartbreaking, but I am so happy for Ghost and his owner. Thank you to everyone who had helped keep the affected cats and dogs sage during and after the hurricanes! Brilliant post and Jessica Lange was ADOPTED YAYAYAYAYAYAYAAYAYAYAYAYA!!!! Thank cod Best Friends and other rescues were there to help these poor animals. What a great interview. This was such a great read! A huge thanks to volunteers for rescuing these kitties in need! What an amazing interview! That must’ve been such an exhausting yet fulfilling time for everyone. And OMC I adore Jessica Lange too. I’m so happy she found her happy ending. Love this interview! I love hearing what so many people are doing to help the animals after such a real tragedy. And what a heartbreaking story about the people who got separated from their cats in the boats. I hope they have been reunited since then. That really is a great reminder that we shouldn’t be so quick to judge and blame people for their lost pets during times like these. Sometimes, despite our best efforts, things don’t go as planned and people unfortunately get separated from their beloved furries. Thank you to all of these wonderful volunteers for being a shining light during such a difficult time! what a great interview! Everyone who helped out is such a hero–hope more owners and pets are reunited! This is such a wonderful thing Best Friends did for the animals in Houston. I was impressed they also took in pets from people who were in the shelters who couldn’t keep their animals with them. Thank you for a wonderful interview. This is amazing! I love the pet reunion pavilion! It’s great that so many wonderful organizations came together to help animals in the path of this devastating storm. I didn’t even think about all the pets who were owned and needed a place to be, like the setup at the fairgrounds. How wonderful to have volunteers taking care of them while their humans tried to figure out what to do next and how to pick up the pieces of their lives. I really enjoyed reading this interview. I am always so impressed by the number of people who organize and help others during rough times. It is crazy that only 2% of cats are reunited after a disaster. I hope more people will microchip their cats! 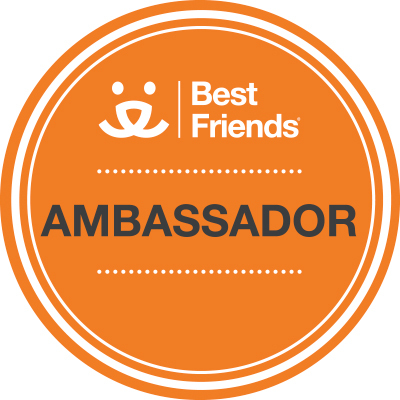 Best Friends is an amazing organization. Amazing post and interview! So glad there are such wonderful humans there for the cats. Incredible job these people do. So happy for the ones who got reunited and heartbroken for the ones who didn’t. We go through this every hurricane season here in Miami. We need more organizations doing this beautiful job. All these animals deserve to be reunited with their owners. Such a great deed from the fellow rescues in Houston. 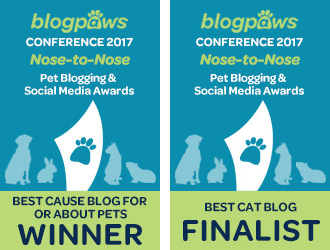 Awwww Chatty Cats, we just loved this post and thank mew so much fur sharing how all the animals were taken care of… it’s so heartwarming to see so many beautiful souls doing their bit to make things better and we thank each and effury one of them! Bless you all for caring for these cats. Where I live, there are millions of feral cats, and the shelters are full. I call them up when seeing a sick feral cat, and they say there’s nothing they can do. I had to pay with my own money several times to take sick cats to the vet, and putting them it the cats carrier is difficult and risky. After the cat is well again, I put her back on the street. Already took three feral cats home and can’t take anymore. Some people around here feed cats, and the neighbors give them hell for it. Nice to see some people are caring.